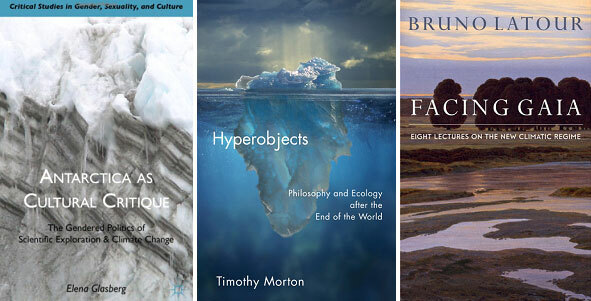 A back-to-school look at books addressing climate change and the humanities. With the fall come brightly covered leaves, football – and hundreds of thousands of students enrolling in humanities courses to meet basic degree requirements. How might climate change figure in these courses? This compilation looks at 12 books, all published since 2010, on cultural, film, and literary criticism with a perspective of climate change. * Descriptions are drawn from copy provided by the publishers. In 2011 Mike Hulme published an opinion piece, Meet the Humanities, in Nature Climate Change. “Although climate is inarguably changing society, social practices are also impacting on the climate,” he asserted. “Nature and culture are deeply entangled, and researchers must examine how each is shaping the other. But they are largely failing to do so.” This book sets out to rectify that, documenting what a broad selection of academics, journalists, artists, and others working in the humanities and social sciences have been writing about climate change recently. It consists of over 200 summaries of such works and provides a good introduction to the range of thinking about climate change addressed by non-scientists, and a good entry point to a growing literature. Climate change compels us to rethink many of our traditional means of historical understanding, and demands new ways of relating human knowledge, action and representations to the dimensions of geological and evolutionary time. To address these challenges, this book positions our present moment of climatic knowledge within much longer histories of climatic experience. Only in light of these histories, it argues, can we properly understand what climate means today across an array of discursive domains, from politics, literature and law to neighborly conversation. Its chapters identify turning-points and experiments in the construction of climates and examine how contemporary ecological thought has repoliticised the representation of nature. Arguing that Antarctica is the most mediated place on earth and thus an ideal location for testing the limits of bio-political management of population and place, this book remaps national and postcolonial methods and offers a new look on a ‘forgotten’ continent now the focus of ecological concern. Global warming is perhaps the most dramatic example of what Timothy Morton calls “hyperobjects” – entities of such vast temporal and spatial dimensions that they defeat traditional ideas about what a thing is in the first place. Moving fluidly between philosophy, science, literature, visual and conceptual art, and popular culture, he argues that hyperobjects show that the end of the world has already occurred. Instead of inhabiting a world, we find ourselves inside a number of hyperobjects, such as climate, nuclear weapons, evolution, or relativity. Insisting that we have to reinvent how we think to even begin to comprehend the world we now live in, Hyperobjects outlines a genuinely postmodern ecological approach to thought and action. For the last three centuries new ideas of nature have been continually developed by theology, politics, economics, and science, especially the sciences of the material world. The situation is even more unstable today, now that we have entered an ecological mutation of unprecedented scale. So the question now arises: what will replace the old ways of looking at nature? This book explores a potential candidate proposed by James Lovelock when he chose the name “Gaia” for the fragile, complex system through which living phenomena modify the Earth. In this series of lectures on “natural religion,” Latour argues that the complex and ambiguous figure of Gaia offers an ideal way to disentangle the ethical, political, theological, and scientific aspects of the now obsolete notion of nature. He lays the groundwork for a future collaboration among scientists, theologians, activists, and artists as we begin to adjust to the new climatic regime. Drawing from recent scholarship that analyzes climate change as a form of “slow violence” that humans are inflicting on the environment, Climate Trauma theorizes that such violence is accompanied by its own psychological condition, what its author terms “Pretraumatic Stress Disorder.” Examining a variety of films that imagine a dystopian future, renowned media scholar E. Ann Kaplan considers how the increasing ubiquity of these works has exacerbated our sense of impending dread. But she also explores ways these films might help us productively engage with our anxieties. Lucidly synthesizing cutting-edge research in media studies, psychoanalytic theory, and environmental science, Climate Trauma provides us with the tools we need to extract something useful from our nightmares of a catastrophic future. Horror films such as Godzilla invite an exploration of the complexities of a monstrous nature that humanity both creates and embodies. Robin L. Murray and Joseph K. Heumann demonstrate how the horror film and its offshoots can often be understood in relation to a monstrous nature that has evolved either deliberately or by accident and that generates fear in humanity as both character and audience. Organized in relation to four recurring environmental themes in films that construct nature as a monster – anthropomorphism, human ecology, evolution, and gendered landscapes – Monstrous Nature applies ecocritical perspectives to reveal the multiple ways nature is constructed as monstrous or in which the natural world itself constructs monsters. This interdisciplinary approach to film studies engages cultural, theological, and scientific critiques. Considering films such as Candyman, Frozen, The Cabin in the Woods, and The Incredible Burt Wonderstone, Michael J. Blouin contends that fantastic tales allow audiences to maintain the status quo instead of inspiring purposeful action. These films promise dramatic change, but they too often deliver more of the same. Although proponents maintain the illusion that the militant enforcement of free-market economics will resolve racism, climate change, and imperialism, their magical thinking actually fuels the crises. Magical Thinking, Fantastic Film, and the Illusions of Neoliberalism explores the ways in which the visual economies of Hollywood fantasy compliment this particular political economy. Ecosickness in Contemporary U.S. Fiction establishes that we cannot comprehend environmental and medical dilemmas through data alone and must call on the sometimes surprising emotions that literary metaphors, tropes, and narratives deploy. In chapters on David Foster Wallace, Richard Powers, Leslie Marmon Silko, Marge Piercy, Jan Zita Grover, and David Wojnarowicz, Heather Houser shows how narrative affects such as wonder and disgust organize perception of an endangered world and orient us ethically toward it. She also positions ecosickness fiction relative to emergent forms of environmentalism and technoscientific innovations such as regenerative medicine and alternative ecosystems. Houser approaches contemporary fiction as a laboratory for affective changes that spark or squelch ethical projects. Anthropocene Fictions is the first systematic examination of the hundreds of novels that have been written about anthropogenic climate change. Drawing on climatology, the sociology and philosophy of science, geography, and environmental economics, Adam Trexler argues that the novel has become an essential tool to construct meaning in an age of climate change. The novel expands the reach of climate science beyond the laboratory or model, turning abstract predictions into subjectively tangible experiences of place, identity, and culture. Political and economic organizations are also being transformed by their struggle for sustainability. Anthropocene Fictions argues that new modes of inhabiting climate are of the utmost critical and political importance, when unprecedented scientific consensus has failed to lead to action. Are we deranged? The acclaimed Indian novelist Amitav Ghosh argues that future generations may well think so. How else to explain our imaginative failure in the face of global warming? The extreme nature of today’s climate events, Ghosh asserts, make them peculiarly resistant to contemporary modes of thinking and imagining. This is particularly true of serious literary fiction: hundred-year storms and freakish tornadoes simply feel too improbable for the novel; they are automatically consigned to other genres. Ghosh argues that literature and politics have become matters of personal moral reckoning rather than arenas of collective action, but the climate crisis asks us to imagine other forms of human existence. His book serves as a great writer’s summons to confront the most urgent task of our time. *Editor’s note: Previous bookshelves have covered ethics and philosophy, religion, and, indirectly, history. 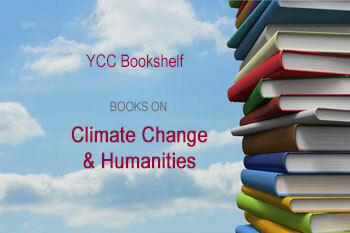 YCC will return to these disciplines from the humanities in future bookshelves.